It was one of the greatest floods ever recorded in Lagos. The entire coastal region of the Mega City was covered in water after the rains refused to abate after four days. It was as if the gods of the ocean had a score to settle with Lagosians. While Lagos suffered no human casualty, about 10 persons were confirmed missing in Suleja, Niger State with two bodies recovered. Lagosians have started heaving a sigh of relief as the weather has been clement for the past three days but it seems the relief is going to be temporal. 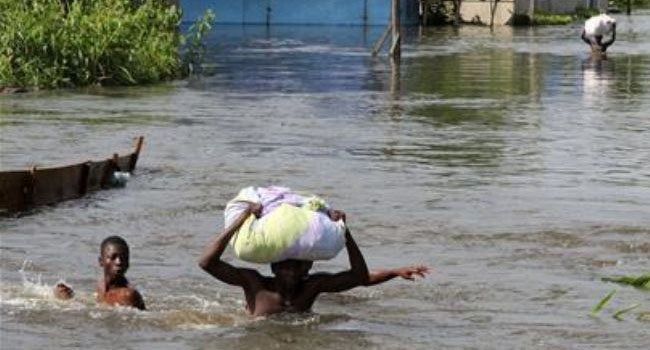 The Minister of Water Resources, Suleiman Adamu, has warned that more floods are coming. The late commencement of the rains, the monsoon wind that usually brings heavy rain in the West African coast, and the rising sea levels due to the melting of glacier in the polar region will further increase floods in Lagos, Rivers and Cross River states. In the latest flood alert advice prepared by the Federal Ministry of Water Resources for the country, the Minister of Water Resources, Suleiman Adamu, stated that the Nigeria Hydrological Services Agency had earlier come out with the flood outlook for the country on June 13, 2017. He notes that 30 states and over 100 local government areas have been categorised as high flood risk areas. The minister called for the construction of more reservoirs/dams to harness and harvest the excess water for various uses in agriculture, industry and power. He said states and local governments should embark on the creation of multipurpose artificial lakes.